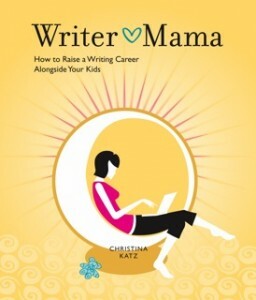 This month for Barrie Summy's Book Review Club I'm discussing Writer Mama: How to Raise a Writing Career Alongside Your Kids by Christina Katz. My sister sent me this book for my birthday last fall, and I was appropriately grateful. Such a cool-sounding book. And such a thoughtful gift! In fact, it's exactly the kind of book I want to have but never get around to reading. Indeed, this was the case. For four months, the book gathered dust on my bedside table. It was on top, right near the front, impossible to miss. I reached over it to select a new novel from the stack behind. Then I decided to take the plunge. I'll review it! I thought. I have a deadline! Now I have to read it, and fast. In this, too, I failed. I could not read the book quickly. But that's because I'm learning so much on every page. I've always wanted to be a writer. I've struggled to build a professional identity in the in-between spaces I can scrounge together with very young children at home. I've wanted to do so much more. But I didn't know what exactly, and I didn't know how. Until now. I was concerned at the beginning of the book, when the author explained how to use a search engine to find things on the internet. But the pace immediately picked up and soon I knew the difference between "fillers" and "articles," when to query with an idea and when to submit a completed piece, how to take manageable little steps right now to meet long term goals later. And the truth is that basic stuff is important. Sure, most people know how to use Google. And I already know how to read and follow submission guidelines. But it wasn't so long ago that I didn't know anything about submission guidelines (that they existed, where to find them, what certain code phrases indicate). Writer Mama makes the industry accessible to a newbie without spending too much time on the basics for the more experienced writer. The author does a good job addressing moms of kids of all ages, not just napping infants or older, independent players. And her advice is realistic. She doesn't recommend plopping kids in front of the TV all morning, but she does acknowledge that a video can be a special treat for a child when her work-at-home mama faces a tight deadline. She acknowledges - and suggests coping strategies for - the inevitability that some people won't see a writing mama's job as being a "real" job requiring disicpline, professionalism, and regular hours. And she points out that we're often hardest on ourselves in this regard. I had a hard time starting this book. I had a hard time reading as quickly as I wanted to read. And I had a hard time finishing in time. (I like to finish a book a few days before I review it to allow time for the sediment to settle in my brain.) In fact, I didn't finish at all. But I'm almost done; I'll finish tomorrow. With this book, I can't skim quickly over the surface of the text; I'm learning something new on almost every page. I'm highlighting; I'm making notes. And it's taking a lot of will power to keep reading and learning at a steady pace. Writer Mama is broken up into 23 chapters, each of which ends with an "Exercise." Every time I come to an Exercise, I want to stop and do it immediately. Not yet! I remind myself, sticking a flag on the page and pushing on, knowing that the minute I read the last page I'll be starting over at the beginning with the first exercise. And once I've completed the exercises - each of which seems totally manageable, non-overwhelming, fun and exciting, actually - I'll have several pieces written and queries sent off to editors. I'll be well on my way from wanting to be a professional writer to actually being a professional writer. This book is teaching me how to do something I've always wanted to do, but never knew if I could do, let alone how to get started, how to build a business, how to make it work. Motivational. Educational. Interesting. Useful. And, did I mention, motivational?